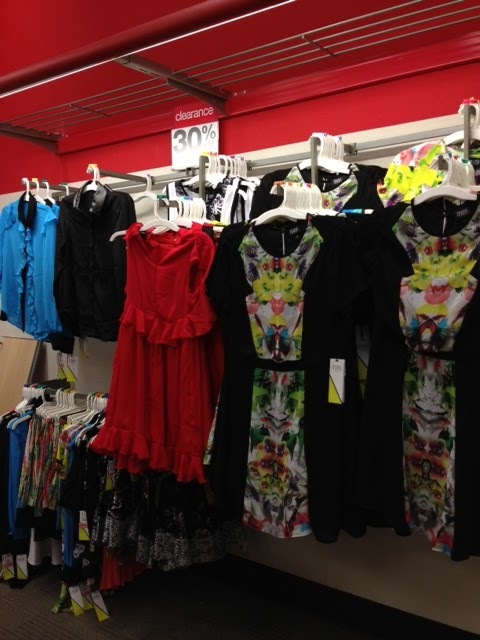 Prabal Gurung launched his collection for Target just about month ago and it's already half off in stores. Unfortunately, online prices are not discounted (don't you hate that) but we bet your local Target is well stocked if our buzzing urban Target is any indication. During a recent trip to the Target on 116th Street, we found a good selection of Prabal items from which to choose. The bright floral drop waste dress is $17 from $35, the black and white meet the parents skirt is $15 from $30, a dress in the same print is $22 from $45, and an apple red dress with full skirt is $25 from $50. In recent seasons, we have complained about the horrible make-your-skin-crawl fabrics used in several designer collaborations. We were happy to notice that the high-tech fabric Modal was incorporated and blended with cotton in many of Prabal's pieces. It may not be as high quality as a 100% brushed cotton but it's generations better than 100% Polyester.